On the second day of Christmas, my true love gave to me, two turtledoves (Streptopelia turtur)...and their blood parasite, Haemoproteus turtur? 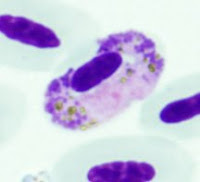 These parasites have a life cycle similar to the malaria parasites in the genus Plasmodium, but do not asexually divide in the host's blood cells, and only invade the erythrocytes as the transmission stages, the gametocytes (shown in photo). H. turtur has been shown to be vectored by the hippoboscid fly, Pseudolynchia canariensis. So, enjoy those turtledoves, true love - you're going to have 22 of them by the time the song is over - but if they get a little lethargic and don't want to "turrrr" (which is how they got their name - it doesn't have anything to do with turtles), it just might be a blood parasite to blame! December 15 - "Blastocystis hominis"